Ever since the Eighties, the British public and media have suspected that the Conservative Government of Margaret Thatcher was heavily involved in corruption surrounding international arms deals. And that the involvement has continued with successor British governments. But while substantive allegations have been made about British defense contractors, not least BAe, offering bribes to those smoothing the path of British arms deals, no-one has been able to link kickbacks to British politicians. Until now. Cast Iron: The Arms Trail To Margaret Thatcher is able to present information about the trail of arms commissions into the British body politic because the author was the best friend of the lawyer who helped to set up the first money trail for the Conservative Party and Margaret Thatcher. On November 15 1988, Hugh Simmonds CBE turned up dead in a beauty spot a few miles from his and the author’s hometown in Buckinghamshire, England. $7.5 million was missing from his law firm. The incident made international headlines: Simmonds had been a rising star in the Conservative Party and Prime Minister Margaret Thatcher’s favourite speechwriter. As one of Simmonds’ closest friends, the circumstances of Simmonds’ death made no sense to the author of Cast Iron, Geoff Gilson. Employing his forensic skills as a lawyer, and his aptitude for asking difficult questions of difficult subjects, the author set out on a fearless quest to discover the truth. The author was immediately launched onto a rollercoaster ride of adventure through the hidden and dangerous worlds of secret societies, arms deals, high-level politics and covert intelligence ops. High-speed car chases in Glasgow, Scotland; cat-and-mouse games with an MI5 officer wielding a military revolver; secretive rendezvous in Montreal, Canada with a former Mossad agent; and a warning-off from the CIA in the backstreets of London. The world of James Bond forms a tense backdrop to the author’s 10-year investigation, which uncovers details of Simmonds’ covert role as MI6 officer, arms dealer and money-launderer for the Thatcher family. Specifically, the author finds a trail of bribes from international arms deals, wending their way deep into the heart of the Conservative Party, and all the way to Margaret Thatcher. Cast Iron is no dry recitation of revelations from 30 years ago. The book represents a living chronicle of the crooked politicians, the fraudulent banks, the ‘clean’ defence contractors and their ‘less-than-clean’ backdoor dealings, all of which are required to support a burgeoning arms industry. As such, the book is a must-read, active roadmap of what to look for in a Britain, which still ranks as the world’s fifth largest arms exporter, and is run by a government dedicated to placing arms sales at the forefront of its export policy. The author of Cast Iron, Geoff Gilson, was for 10 years active in the Conservative Party, up to and including the national level. He trained as a lawyer, and pursued a commercial career in public relations. Currently, he is focusing on his creative interests, and resides in a small mill town in central North Carolina. The book Cast Iron alleges that when Margaret Thatcher took power in 1979, she was met with a Great Britain that had been bankrupted by the socialists. Thatcher knew that to put matters right would take strong medicine. And that one of the side-effects would be decimation of what was left of Britain’s industrial base. So, Thatcher set in motion a plan to revive the country’s manufacturing core based upon a massive expansion of the arms industry. The plan worked. Today, Great Britain holds the No. 5 position for arms exports worldwide, and almost one in every five employees in Great Britain is associated in some fashion with the arms industry. But this success has been achieved at a huge cost. Namely, the systemic and comprehensive corruption of Whitehall and Westminster. In order to build up arms sales, and then to maintain continuity of supply, both the Conservative Governments from 1979 to 1997, and the New Labour Administrations from 1997 to 2010, had to be prepared to do business with embargoed countries and entities, by employing unacceptable business practices, including wholesale bribery. Legitimate arms deals were processed through the ‘front-door.’ For more questionable dealings, a semi-official, and highly-organized, ‘back-door’ was put in place. 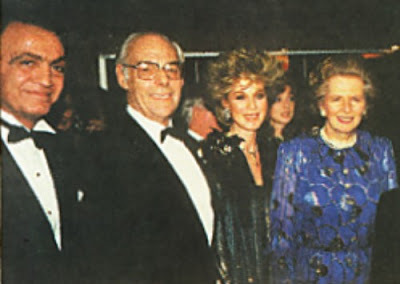 It is the contention of Cast Iron that Hugh John Simmonds, CBE, a former member of the Conservative National Board of Finance, and one of the best friends of the author of Cast Iron, was a primary part of the ‘back-door’ during the Thatcher years. 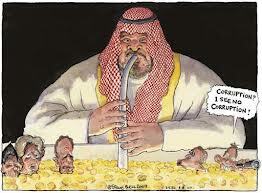 The British media have known for some time of the illicit arms activities of the Conservative Party. What they have lacked is the money trail to prove it. Cast Iron provides the definitive clues as to that money trail, which was originally set in place by Hugh Simmonds. Cast Iron alleges that Simmonds died because he knew too much about the arms corruption, originally set in place by the Conservatives, and then perpetuated by Tony Blair and New Labour. The Law Society subsequently bankrupted Simmonds’ Estate, valued at some $1.75 million, and then closed the books, leaving Simmonds’ family destitute. Simmonds’ father had to dig deep into funds that he had spent a lifetime accumulating, just to rescue Simmonds’ family. At the time of his death, and whatever the nefarious circumstances surrounding it, the fact is that Hugh Simmonds was acting for the then Prime Minister of Great Britain. Simmonds’ family deserve to know the truth about Simmonds’ death. They should not have been left to suffer the attendant financial consequences and stigma, all on their own. And the British people deserve to know the truth about those they elect to trust. In this latter regard, there is no reason to believe that arms corruption in Whitehall and Westminster has ended. There were worrying footprints of exactly the same arms corruption all over the LibCon Coalition Government of David Cameron and Nick Clegg. For example, Alan Duncan, whom The Sunday Times fingered as the successor to Jonathan Aitken, as the Saudis’ Conservative arms bagman in Great Britain, was, until the reshuffle in the summer of 2014, Minister of State at the International Development Office, where he was personally responsible for overseeing the financial vetting of countries wishing to receive aid from Great Britain. That same vetting is the process also used to determine whether or not those countries are suitable to receive Export Credit Guarantees in respect of arms purchases from British defence contractors. During Thatcher’s efforts to expand the arms industry in the Eighties, both by the ‘front-door’ and by the ‘back-door,’ the Export Credit Guarantee Program was illicitly commandeered massively to underwrite all manner of arms deals, which never paid off, and left the Program almost bankrupt. More on this and other alleged footprints of current British Government arms corruption can be found on Geoff Gilson’s Facebook post on the subject.